To measure overlap, tape width and registration from one tape to the next. 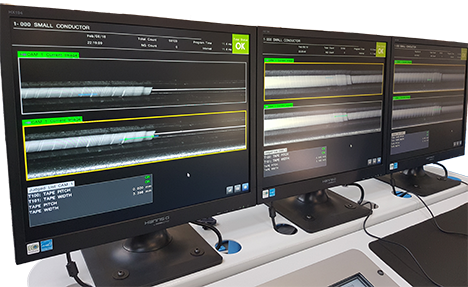 The addition of camera technology captures each individual wrap frame by frame, constantly adjusting the taping head to ensure accurate tape registration between layers and compliance with ever demanding customer specifications. The camera technology can be used on a wide range of tape materials including Mica, Kapton® PTFE and Paper. The camera system comprises of a digital camera assembly, LED light, image acquisition software and associated hardware. An industrial PC and associated hardware are fitted in the control console, which is located next to the taping machine that has the camera system fitted. The monitor, keyboard and mouse allow the operator to set up the system. The output from camera system inputs into the taping machine control system, thereby allowing positional control of the taping process.